Margaret (Roberts) Thatcher was born October 13, 1925 in Grantham, England. Her parents owned and operated a grocery store. Margaret and her older sister Muriel lived with their parents in rooms above the store. She would later describe her life in the town of Grantham as a "decent and wholesome one with values shaped by the community rather than the government". As for her spiritual development she gives credit to her parents and the writer C.S. Lewis for having a great impact on her life and how she viewed religion. As she was growing up she listened to the men who came to the grocery store discuss politics with her father, and from the time she was a small child she was surrounded with this early political training. Her father, Alfred Roberts, gave her small jobs to do during the elections. She studied diligently in school in order to pass the entrance exams for the university. She went to college in Somerville, but had her sights set on Oxford. In order to qualify for entrance to Oxford she needed to have studied Latin for five years. She had a lot of chemistry credits, but no Latin, so in one year she learned enough Latin to pass the exam. When she left to attend Oxford she was 16 years old, about to be 17. The years she spent at Oxford were the war years of World War 2. She volunteered as a fire watcher several hours a week and worked at a snack bar for soldiers. For some reason Oxford escaped the bombing that many cities in England endured. During one vacation time in 1944 she taught science in Grantham and earned enough money to purchase a bicycle which provided needed transportation at Oxford. After getting a degree in chemistry she worked as a chemist for a food manufacturer. She is credited with helping to invent soft-serve ice cream which can be dispensed from a machine rather than scooped by hand. In 1948 she was chosen to represent Oxford graduates at the annual conference of the Conservative Party. The members of the party were called Tories. While she was at the conference she talked to John Miller about running as a candidate in the Dartford district. Later in a short talk she made for the local voters, her father, who had recently been chosen as mayor of Grantham, spoke up on her behalf. At about this time she met a young Conservative named Denis Thatcher and they became good friends. She made a good showing in the election, but did not win. Then in 1951 she ran again but lost. Shortly after the election she married Denis and Margaret Roberts became Margaret Thatcher. She believed a woman should be able to have a career and also fulfill her role as a wife and mother, and Denis fully supported his wife's ambitions. Denis, who was nine years older than Margaret, provided a comfortable income for the family and Margaret, the chemist, started studying to become a lawyer. A friend suggested to her that one way to get a law degree would be to get a job in or near London and join one of the Inns of Court and study for law exams in the evenings. This is what she did, but before she could take her law exam a major event occurred in their lives. Margaret was expecting a baby. Six weeks before "the baby" came they found out they were going to become the parents of twins. They scurried around to get duplicates of the things they had purchased for the expected arrival. In 1953 she gave birth to a son and a daughter, Mark and Carol. Four months after they were born Margaret took and passed the bar exam. She never lost sight of her goal to become a Member of Parliament (MP), but during the next few years she devoted herself to being a wife and mother. When the children were six years old the Thatchers bought a house in Kent. It had a 1 and 1/2 acre garden with space for Mark and Carol to play. Margaret, to protect the children from falling in the pond, filled it with dirt and made a rose garden there. Nannies helped with the children while their parents were busy with their careers, but Margaret made sure the family spent a lot of time together. She always managed to cook breakfast for Denis and the children. Weekends were spent gardening and baking, and on Sundays they took the children to church. In 1959 the district of Finchley was looking for a candidate to represent the Conservative Party. Some men of the party thought people would not elect a woman who was the mother of two small children, but she overcame their objections and became their candidate. She was elected and on October 20, 1959 at the age of 34 she became a Member of Parliament. Through the years the Labour Party had started new programs that expanded the role of government in the lives of the people of the British Empire. Margaret as a right wing Conservative favored cutting taxes and less government involvement. She advocated reducing the government's role and she wanted people to take more individual responsibility. "I think we've been through a period where too many people have been given to understand that if they have a problem, it's the government's job to cope with it. 'I have a problem, I'll get a grant.' 'I'm homeless, the government must house me.' They're casting their problem on society. And, you know, there is no such thing as society. There are individual men and women, and there are families. And no government can do anything except through people, and people must look to themselves first. It's our duty to look after ourselves and then, also to look after our neighbour. People have got the entitlements too much in mind, without the obligations. There's no such thing as entitlement, unless someone has first met an obligation"
The Cabinet of the Labour Party, which was in power, ran the government, but the party out of power had a "shadow" cabinet. Edward Heath, the Conservative leader, appointed Margaret Thatcher to be his Shadow Secretary for Education. As a member of the Shadow Cabinet her main role was to explain what "women" were likely to think and want on troublesome issues. A year later when the Conservative Party came into power she became the real Secretary for Education. In this role, in order for the party to cut taxes, she had to reduce the education budget. No money was provided for free milk for the schools. The people accused her of taking milk from the children. She came under fire because parents were required to pay for their children's lunches. The Education White Paper of 1972 aimed to restore better education. She wanted smaller schools and an expansion of the nursery program for 3 and 4-year-olds. Many schools were replaced and the younger children were helped, but money to finance the changes was becoming scarce. In 1975 Ted Heath was forced to resign as Prime Minister and the Tory Party cast their ballots for Margaret Thatcher to become the next Shadow Prime Minister. (The Conservatives were not in power at the time.) She got 53% of the votes. She and Denis had a home near Parliament and the twins were 21 years old. The time was right. Earlier when Mrs. Thatcher was asked if she ever dreamed of being Prime Minister she had replied, "No woman in my time will be Prime Minister". However her assessment was going to prove to be wrong. For her to become the Prime Minister, the Conservative Party had to win the next election. She softened her image; got a new wardrobe, worked to make her voice less sharp, and took trips around the world. But she was not really a softer Mrs. Thatcher. 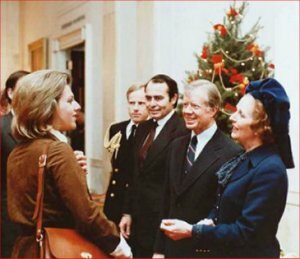 Her remarks about the Soviet Union resulted in her being labeled "The Iron Lady". She remarked at a rally, "Britain needs an Iron Lady." In the election of 1979 she became the first female Prime Minister of Great Britain. On April 2, 1982 Argentina invaded the Falkland Islands which were owned by the British. Prime Minister Thatcher first tried a diplomatic approach, but when diplomacy failed she ordered the British naval task force to retake the islands. A short war ensued and resulted in the British retaking the island on June 14. The British lost 259 men in the battles and Argentina lost 649. 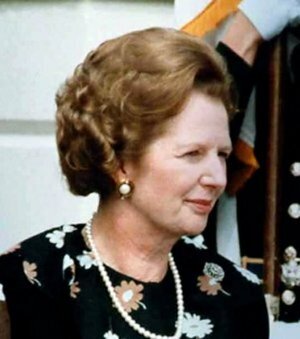 The victory in the Falklands assured the reelection of the Conservative Party and Margaret Thatcher was elected for a second term in the 1983 elections. The coal miners' strike of 1984-85 lasted for a year. The majority of the mines were unprofitable and were draining money from the government at an alarming rate. The political power of the National Union of Mineworkers (NUM) was broken when the government held out against them. Miners and their families suffered as a result of the strike and events surrounding it caused a lot of hatred for the Prime Minister. But in its wake more fiscally responsible programs were installed and the country ultimately benefited. Most of the mines were eventually closed and those that weren't closed were sold to private companies. 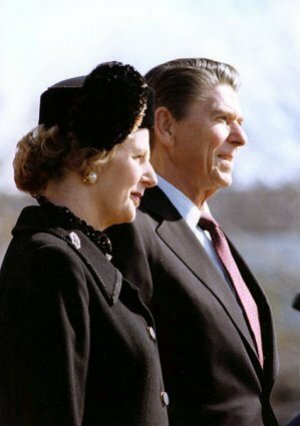 Margaret Thatcher had great respect for Ronald Reagan. She first met him in the 1960's after her husband heard him speak and told Margaret about Reagan's ideas. She read his speeches favoring tax cuts and a stronger national defence and she agreed with all his theories. In the following years when Reagan was President of the United States they met on several occasions and talked about policies which would benefit their respective countries. While many favored the United Nations as a world government, she saw dangers in allowing such a group to have the kind of power they were outlining. She thought it would lead to world disorder if nations had to give up their sovereignty and let another organization make decisions for them. She said unity of purpose, not unity was the objective. Individual nations cannot exist in a vacuum, but are influenced by and in turn influence other nations of the world. Leaders of nations cannot close their eyes to injustices and persecutions some countries foist on their own people. She thought nations should work together. She outlined Five Principles of Conservative Foreign Policies to address these challenges. 1. For the security of nations there needs to be a strong superpower such as America which will need dependable allies willing to share fully in promoting freedom and justice. 2. In foreign policy the value of the balance of power in regional contexts must be recognized. States in an area should band together to oppose a dominant power which threatens to overtake a weaker state. 3. Nation states and national sovereignty are the best foundations for a stable international system. There needs to be national pride and a common language for a nation to succeed. 4. For practical purposes nations should persistently seek to advance freedom, democracy, and human rights across the world. Democracies do not generally make war on each other and nations that respect human rights at home don't usually promote aggression against other nations. 5. There needs to be a strong national defence. Wars generally occur when a predator nation thinks it has a superior arsenal of weapons to succeed in a takeover of another country. In 1984 an attempt was made on her life. A bomb was detonated at the Brighton hotel where she was staying. Five people were killed and 30 were injured. She survived because she was up late working on a speech she was to give the next day. Undeterred, she gave the speech as planned. She said, "This attack has failed. All attempts to destroy democracy by terrorism will fail." In 1990 a poll tax known as a community charge was passed. Instead of a property based system, it was a flat tax with each person paying the same thing. It hit poor people and the middle class especially hard and they could not afford to pay it. There were riots in the streets and 15 million people refused to pay the tax. The courts were overrun and the conflict eventually led to Mrs. Thatcher's downfall and a call for her resignation. She served three terms as Prime Minister from 1979 to 1990. After she retired she experienced a sense of loss as to what she should do next. She wrote two books, The Downing Street Years written in 1993 and The Path to Power in 1995. In 2002 she published the book Statecraft outlining her views on international politics. John Major followed her as the next Prime Minister. Though she saw her policies being reversed, she wanted him to succeed and tried to give him the benefit of the doubt. Her husband Denis died in 2002. They had been married for more than 50 years. She began to have a series of small strokes and started having memory problems. She passed away on April 8, 2013. During the time she served Great Britain as Prime Minister she had been called "The Iron Lady", "Battling Maggie", and "Atilla the Hen". Few women have been as respected by some and hated by others to the extent that Margaret Thatcher was regarded by the people of Great Britain. This biography by Patsy Stevens, a retired teacher, was written August 4, 2013. This page displayed 21,610 times.